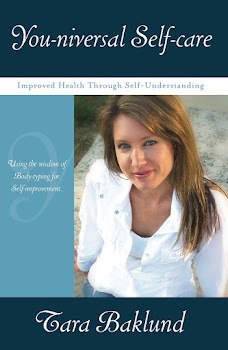 Author: Helping You Understand Your Body! You-niversal Self-care is about the foods, exercise and habits for each Body-type to feel balanced. The information presented on this website and other media presented by Tara Baklund is meant for informational purposes only and is not to be taken as medical advice. It is of the utmost importance to take responsibility for ones own health and to seek professional help when (hopefully before) the situation calls for it. Copyright Tara Baklund 2016. Simple theme. Powered by Blogger.